Rotarians, family members, and Interactors joined in a visit to Pulau Bidan, off Tanjung Dawai at the mouth of Merbok river. RC Bandar Sungai Petani, RC Perlis, RC Tanjung Bungah, RC Metro Ipoh, RC Seremban and Interact Club of SMK Dato' Bijaya Setia participated. 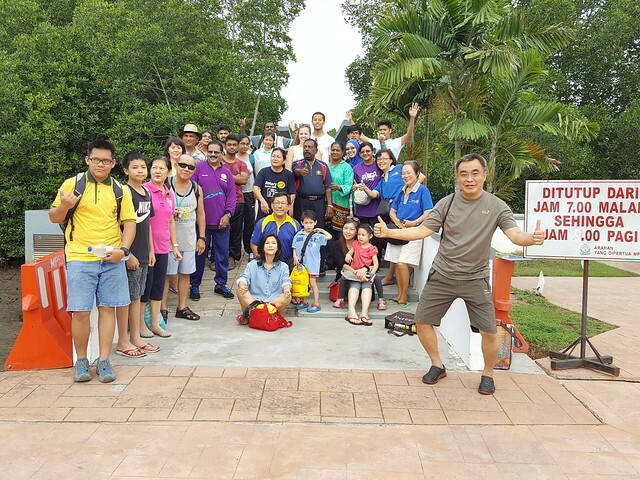 We assembled at the Merbok Ecopark jetty at the Semeling Bridge, and visited the mangrove forest & museum of Merbok history. This was the site of the oldest civilization in South East Asia. Then on to the boats. The first stop was at Pak Su's Oyster Farm at Sungai Batu. We had a insight into how oysters were cultured for a year before they were ready for consumption. The boat ride to Pulau Bidan itself took about an hour, with beautiful vistas of the river, mangrove forests and majestic Gunung Jerai. On the island, we were briefed on the Permaculture activities there, run by volunteers from all over the world. Lunch under the trees was followed by beach cleaning activity, and lazing in hammocks. On the way back, we stopped at Tanjung Dawai to shop for sea food products and Pak Su's Oyster Farm again to slurp in the oysters (cheap and fresh!). The day ended with Mee Ketam in Kampung Telok off the Western Bypass. Hoping to contribute to environmentally-friendly development of Pulau Bidan and promote Permaculture here. Scroll though the Flickr album for more photos below.